Iwachu Cast Iron Teapot, Tetsubin Gold and Brown Dragonfly 16 oz. 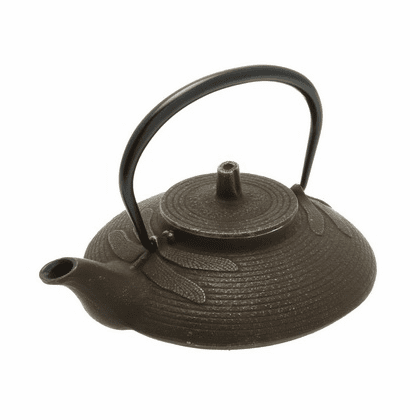 Home | Japanese Cast Iron Products | Iwachu Cast Iron Products Made in Japan | Dragonfly Cast Iron Tea Pot Series | Iwachu Cast Iron Teapot, Tetsubin Gold and Brown Dragonfly 16 oz. Two dragonflies adorn sides of this cast iron teapt. Great for displaying and steeping your favorite tea. Has a stainless steel infuser basket and black enamel lined interior. 6-1/4" in diameter. Capacity: 16 oz. This teapot comes in gold and brown and is manufactured by Iwachu, in the Iwate region of Japan.